Planetwise wet bags are the perfect way to keep your wet, dirty, or smelly items contained. Use with a wet swimsuit to keep your other clothes dry and sand-free. Throw your sweaty running clothes into a wet bag before mixing with your daywear. Store dirty cloth nappies in a wet bag to use as a mobile, smell-containing holder. Best of all, Planet Wise wet bags are all machine washable - so when you get home, simply open your wet bag and dump it, and its contents straight into the wash! Planet Wise brand reusable wet bags keep plastic bags out of our landfills. Planet Wise Wet Bags are made with a high-quality polyurethane laminate (PUL) inner that is anti-microbial and inhibits the growth of bacteria and fungi. 100% cotton outer. PVC-free interior and lead-free zippers make it the perfect bag for your family and our environment. The Planetwise wetbag is a funky and practical storage bag with so many uses! Each bag is innovatively sewn with hidden seams and sealed for no wicking or leaking. First and ONLY in the industry! Patent pending on the waterproof design. Machine wash and dry with clothes or cloth nappies (please do NOT use bleach). 100% Waterproof Innovative Seam Sealing. Most waterproof material, when sewn, leaves tiny holes in the fabric allowing liquid to seep out over time. Some companies use a sealing tape to make their seams waterproof, this almost always fails and the tape comes off at some point causing a mess. After a lot of research, Planet Wise Inc has discovered an innovative way to seal the seams so NO liquid can escape out the waterproof seams. Try it! Fill your bag with water and give it a squeeze! The fabrics are beautiful. The bag is pretty and well made for wet items. The corners could be finished better as they are a premium product but this lack of finishing doesn’t inhibit how they work. I wish I had gone for the medium sized bag as there is no way 2 dirty (reusable) nappies would fit in the small one without busting the zipper. Super product, works really well for cloth nappies. I absolutely love this bag. It does not leak and I use for everything. Can't get enough of it !! I love the print on this bag and how well it washes. I use it instead of a nappy bucket for reusable nappies. 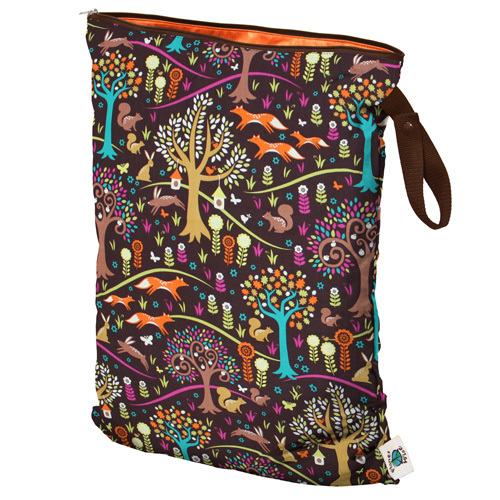 I love planetwise bags, the pattern is gorgeous and they are super quality. I think that Planet Wise goods speak for themselves - a great product with a gorgeous Michael Miller print on it. The service at Earthmother was absolutely superb. Enough emails to know where you are at without it becoming intrusive. Can't ask for better. Quick dispatch and delivery.